You may be asking: "Why is it important that my program is accredited?" and "What is accreditation?" According to APS, accreditation "refers to the process of external assessment to determine if a course (and the higher education provider offering the course) meet the Australian Psychology Accreditation Council (APAC) Accreditation Standards for Psychology Courses. Courses which do not achieve APAC accreditation are not eligible for Approval by the Psychology Board of Australia (PsyBA) as programs of study suitable for the purposes of registration as a psychologist in Australia." This applies the same to the overseas courses provided by universities in America and UK, and hence will be accredited by the APA and BPS respectively. In short, if the program you are doing is not accredited by either the APA/APS/BPS, your program will not be recognised to allow you to be registered as a psychologist. This explains for why taking accredited programs is important. SPS does not accredit any courses, but recognise any degrees that are being accredited by the respective accreditation councils by the societies/associations. To quote them, "The general rule is that the psychology degrees must be recognised or accredited by the national psychological bodies in that country, or are completed at and conferred by universities that are recognised or accredited by the relevant authorities in that country, or are recognised as qualifications to apply for registration or licensure as qualified psychologists in that country." APA-CoA only accredits "doctoral graduate programs in clinical, counseling and school psychology, and programs offering combinations of two or more of these areas. The primary professional degrees offered are the PhD (Doctor of Philosophy) and PsyD (Doctor of Psychology)." To add, "The APA-CoA does not accredit schools or universities, or programs at the bachelor’s or master’s levels." To check on the individual programs, please check on the links to check respectively. For APS, which is the accreditation body for psychology in Australia, all programs have to be accredited, from all the undergraduate to the postgraduate programs. Only those programs offered by the universities in the list and conducted in Singapore are accredited by APAC. From there you can check whether your university and the program is on the list. In the BPS link, you will have to select your respective program (undergraduate/postgraduate), and go through the list to see if your program is in the list. You may also search by selecting the institution/university to see if the programs are available. Similar to APS, all programs have to be accredited by BPS. Just a note: Accreditation is different from the program being permitted to be conducted by the Council of Private Education (CPE) in Singapore. To check whether your program (conducted by a private education institution/foreign institute) is permitted, please check via this CPE search. From my understanding, your overseas program is recognised in Singapore, as long as it is accredited by APA/APS/BPS, and also permitted by CPE. So just to be clear, if I take a non-accredited course such as the ones at NTU, NUS or UniSIM, I won't be able to register as a psychologist if I move to Australia or the UK, correct? But what if I want to use my bachelor's degree to get a 'regular' job in Australia such as working in HR? Does the fact that I'm non-accredited/not a registered psychologist matter? Will a non-accredited Bachelor's degree from UniSIM suffice for that? Does the accreditation only matter if you want to practise as an actual psychologist? And what if I have an APS accredited course and want to work in the UK? You can get your qualifications verified by the APS (http://www.psychology.org.au/membership/qualifications/) or BPS (http://www.bps.org.uk/careers-education-training/society-qualifications/non-uk-applicants/applicants-outside-uk) later, if you move there. It should not be an issue, if you do not plan to be a psychologist or work in related fields. I am not too sure about other fields, but membership with a professional society or association sometimes help in the job application. I believe it would work the same way as mentioned above, from Singapore to Aus/UK. does that mean that without being accredited, my NUS psychology degree will not be recognized in Australia and I will face difficulty in registering to study in an Honours/Masters program in Australia universities? To get into the Honours/Masters program in Australian universities, that would really depend on the exemptions and credit recognitions given by the universities for their programs. In my opinion, I feel that there should not be much issues, as the curriculum of the NUS psychology program is quite good. Maybe you can try it out by asking JCU Singapore about possibilities of entering their Honours or Masters program, as there is a local campus in Singapore? My wife has a Masters in Psychology from a Canadain University but MoM has said he's not qualified to practice in Singapore. To my understanding you only need a degree level to practive phyc here. Any adive on how to appoach this? Is she a registered psychologist in any country, i.e. UK, US, Canada, etc.? 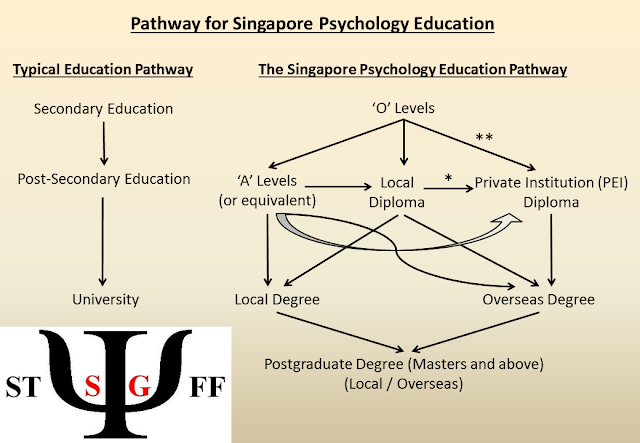 The best way to go about this is to get her to apply as a Full Member of SPS, followed by getting herself registered as a psychology (details here: http://www.singaporepsychologicalsociety.org/pdf/applicationsrp.pdf). This will ensure that she is a registered psychologist in Singapore, allowing her to practice in Singapore. Thank you so much for your reply. No she's not registered in any other country, but as I understand it in Canada you have to get a job that specifically states "Provisional Psychologist" in the title after doing your Masters then do your supervised hours, if Psychologist isn't in the job title than you can't apply to be a Registered Psychologist. Thank you for the link to a SPS application, she has completed over 1500 hours of supervised work in Canada, might this qualify her for registration in Singapore? I know that each case is different but just wondering if it's worth her trying to register. Thanks again! Hi, I cannot confirm if it will qualify her for registration, so I am not the authorising body or in the authorising body. You might have to send an email to SPS to verify that. I believe the link in the previous reply has the minimum criteria. I am considering Flinders University Bachelor of Psychology (Honours) as my degree. I know that the course is accredited by APAC. However does this mean that the degree is also recognized in Singapore? Please email me at sgpsychstud@gmail.com and we can discuss in more detail. My wife gained her psychology qualifications in Russia, would she be able to get provisional registration in Singapore in order to work towards practising here? If she is able to get SRP registration, work should not be an issue. Hi there, I just completed my bachelor of arts in psychology from Murdoch University. I would like to know where can I apply for masters program. With NIE master in applied psychology, can i become registered psychologist in Singapore. Please advise me on this. Thank you. You may want to consider to do an Honours program before embarking on your Masters. This is an invited post by Dr Majeed Khader. Dr Khader is Chief Psychologist at the Singapore Police Force and Director of the Home Team Behavioural Sciences Centre, Home Team Academy. He is also an Adjunct Assistant Professor at NTU where he teaches criminal and forensic psychology. Please direct all your questions to majkhader@gmail.com or Khader_Majeed@spf.gov.sg. Thanks! When I tell those I meet that I work as a police psychologist and have been trained in forensic psychology, most ask me if I am a criminal profiler! Much as I would relish the notion of making my job sexier; this is not the whole truth! What is forensic psychology then, if it is not just about criminal profiling as popularly made out in the media? Because the word ‘forensic’ comes from the Latin ‘forensis’, meaning ‘of the forum’; where the courts of ancient Rome were held; ‘forensic psychology’ is about the intersection between psychology and the criminal justice, civil justice and legal systems. Finally after 4.5 years, there is a revision of this list! Based on my pathway model below, you have almost reached the end of the model when you finish your undergraduate degree, and the next step is to move on to a postgraduate degree in order for you to become a psychologist. For students who wish to further your studies in Singapore, this list has all the postgraduate degrees available in Singapore, their specialties, candidature periods and structure of the course. "Did you know that a psychologist's average pay in Singapore is only 4 to 5 thousand dollars a month? But in overseas, a psychologist's pay in a private sector is around 9 to 10 thousand dollars. That's almost like a professor's pay in Singapore. Four to 5 thousands dollars is like a nurse's pay overseas. The issue is that psychologists are not considered as prestigious as other professionals like doctors or lawyers. Even teachers in schools seemed to be of quite a standard. Maybe we should aim to become professors. The main difference between professors and psychologists is that professors publish more papers. Even if you are a psychologist in a private sector, you will only publish a few papers a year. With more papers published, you get more fame and more pay too.."
To end our series on the mental health scene in Singapore, we will be briefly introducing the major agencies and Voluntary Welfare Organizations (VWOs) who are heavily involved in the advocacy, education, and treatment for mental health related issues. The main purpose of this post is to compile and summarise information about these various organizations. All information and pictures here are taken from their respective web pages, so to find out more we recommend that you explore their respective websites. All the organizations below provide volunteering opportunities if you wish to be more active and make a difference in the lives of the mentally ill! *Images displayed below are obtained from their respective (or related) websites.